In 2012, an American man was arrested for killing an American soldier for not believing in God: murder of Jose Ramirez. What would you eat if you were hungry? Probably anything you could catch, such as that uncivilized “bushmeat,” such as deer or rabbit or possum. Read “Granny’s mean pot of bushmeat stew,” by Tara C. Smith of Aetiology. Mapping from satellite pictures can warn scientists and governments where illegal logging is taking place in Africa. I know I’m mixing up times and environments. Here’s the real news: A fossil pterosaur has been found in the Sahara desert. It has a wingspan of about five metres. The fossil comprises most of the bones of one wing and a number of long, slender teeth, which indicate a fish-catching habit. Just look at these twenty examples of evolution for camouflage. Above, the geckos that look most like leaves avoid predators and catch more insects. Below, potoos and owls that succeed in blending in with tree branches avoid the daytime attention of hawks and eagles. The gallery also ha a photo of a Vietnamese mossy frog in full, frilly glory. Verreaux’s Coua (Coua verreauxi), originally uploaded by jmittermeier. 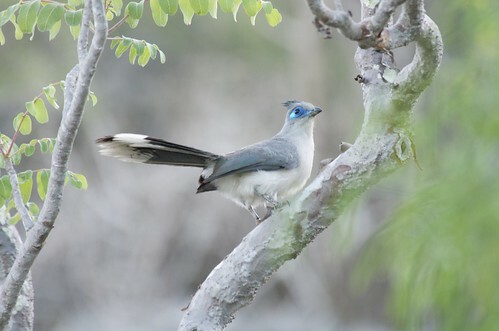 Coua verreauxi is a member of the cuckoo family that lives in a very small area of southwestern Madagascar. The bird lives on the shores of a single salt lake and is classified as Near Threatened. It lives in dry-adapted scrubland and is threatened by habitat loss. You can see a video clip here: BBC, Zoo Quest: Island of Marvels, Part 3. Video clip, 0:06:50 – 0:08:35, Verroux’s coua. the bird in this clip is puffed up against the cold.